Some notes about what you eat, the importance of protein for building muscle strength and when to have a milk shake. Nutrition is just a fancy word for the food you eat. All food gives us energy, measured in calories, so there is no such thing as Junk Food – Fast Food yes but Junk Food no. It’s all food and as the saying goes we are what we eat. The key is to eat a varied diet ensuring your body gets all the vital food groups, vitamins and minerals it needs. There is nothing wrong with eating a burger and French fries, but you can’t live on this alone, the body needs other foods to provide you with all the chemicals it needs to survive. Your body is a chemical factory which has to be in balance, too much of one thing and too little of another and it won’t function how it should. All those fancy diets may or may not work it depends on who you are. The most important thing to remember is that to lose weight the sum of the energy you use through exercise and your body’s metabolism must be less than or equal to the calories from the food you eat. If input is greater than output you will put on weight. Not withstanding you will gain weight by building muscle, but you will look fit not fat. When your body works it uses energy in the form of carbohydrates, these come from your food. 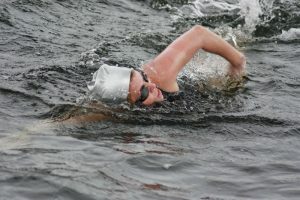 With endurance sports your body has to be refueled or it will go to its fat reserves and use those, which isn’t a bad thing. To break down the fat, protein is required, so during an endurance event protein intake is a must. If not, protein is extracted from your muscles which will weaken them. 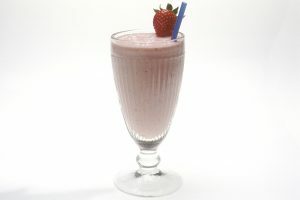 The importance of protein for climbers – milk shake magic! As you exercise, you strengthen and improve your muscles but if they doesn’t have the protein to build with, then they can’t grow bigger or stronger. Just like body builders, climbers must take in protein either during or after exercise. The best form is milk. That’s why Alter Rock sells milk shakes. Whey powder is just dried milk with some other bits added which you add water to. Body builders use this. We don’t want to be body builders, we just want strong muscles, but we do need to keep them in shape. Like most chemicals that pass through our bodies the body will only absorb what it needs. Extra protein can not be stored. Body builders need extra protein to develop their muscles, they will absorb the extra they take in but under normal exercise conditions having a normal diet will give your body enough protein. A good source of protein is meat, but this is high in animal fat, which can cause gall and kidney stones and along with that the recommendation is you should only eat 65g of meat a day (that’s a single sausage!) Excessive meat intake is also linked to bowel cancer. After climbing or any physical exercise including work, your body will be looking to rebuild its muscles and it is protein that it will require, so on the way home try buying a milk shake instead of the fizzy pop or energy drink. Your muscles will thank you for it. What’s yoga got to do with climbing? Next time you are with your parents, whom I guess are probably 20 years older than you, just sit and watch them and see how they do things. Do they struggle with the simple tasks in life? Do they complain about slight aches and pains, little niggles? Do they get out of breath doing the simplest tasks? At the age of 41 I noticed all the little things catching up with me. I had tried to break my body over my life and failed but now, along with my climbing partners, I was getting niggles, things that didn’t quite do what they should. I watched my parents and thought at their age I want to still be able to do all the things I do now. Look at the old in our society, that’s all of our futures. It will happen, you will get old, but do you want to be like the majority? If not act now like I did, the younger the better. I decided to start practicing Yoga. My thoughts when I was younger were; its hairy fairy – for girls – not my thing. Well a lot, if not all, top sports people are studying Yoga. Yoga is simply stretching and it opposes the action of the muscles we use for playing sport. I started doing a hourly session once a week. I was by no means flexible and never have been. Doing a session once a week may hold back the tide but won’t really improve things. After about a year I asked my teacher about a daily routine. Now I stretch every morning (if time allows) and every evening whilst watching TV. 3 years later my flexibility is great, but above all I have no niggles and feel alive after every stretch. With this added flexibility my climbing and other sports have improved. Don’t be misled, yoga and stretching seems quite sedate but the more you put into it the more you get out and you will feel tired, it takes muscles to stretch so they get a good work out. If you ever see a women the age of 85 who is looking spritely and fit for her age it would probably be a safe bet they she is a yoga teacher. Put it another way, you never see an unfit yoga teacher. Climbing Grades – Useful guidance or mental stumbling block? In this blog I will discuss different grading systems and how we grade the routes and problems at Alter Rock. Then think whether grades get in the way of your enjoyment of a climb and can act as a mental block. At the end of the day grades are only there as a guideline and you should enjoy your climbing regardless of what grade you are attempting. This is a very emotive subject. Most of us, but not all, like chasing grades because we want to be seen as hard climbers and that we can hold our own when we are asked what grade we climb at. Grades are very complicated, with different countries having their own grading systems which they then try and compare with each others systems. But for indoor climbing generally the French/Spanish sport climbing grading system is used. At Alter Rock we have decided to use a simple tagging system for the bouldering grades, Very Easy, Easy, Hard and Very Hard. This can be crossed over into V grades. 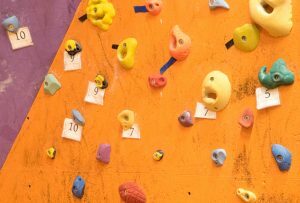 In the outdoor world famous climbs get repeated by many climbers who have an input on what grade it should be compared to other established climbs. This can take many months to achieve a consensus or even years. Indoors the setter sets the route with an idea what sort of grade he is trying to achieve, tests it once on a top rope gives it a grade and walks away leaving it for the customers to try. Routes generally stay set at Alter Rock between 12 to 16 weeks before they are removed and replaced. This makes the argument about what grade it is a bit pointless as it is not there forever. Grades are there to ensure you have a nice time and from an outdoor point of view to ensure you do not end up in a position that may potentially hurt you or even worse. Grades do have a physiological effect on the climber. Often we look at the grade and think or even say “I can’t climb that it’s too hard”. And that’s it we don’t even try, and if we do its a half-hearted attempted because we have already told ourselves we can’t do it. All climbers have different abilities and different styles of climbing because they choose to climb different routes on different rock, cracks, overhangs, short routes, long routes, grit, sandstone, limestone, slate, sport and trad, the list is endless and because Alter Rock uses a variety of setters there is always a variety of climbs and along with it a variety of grade which may not be consistent. The only way to have grading consistent throughout the centre is to have 1 person climb them all, but 1 person’s 6a could be another person’s 6b or 5+. They could be tall or short, on form or not on form. The route could be set in the really nice crimps they like or with the horrible rounded holds they don’t like, or it could be on the slab where friction and balance are key or through the stepped over hang where big powerful arms are required. And there’s the problem; we are all different. Perhaps the next time you do a climb that you think should have been easy for you perhaps just reflect, maybe you are tired, did you miss that secret hold around the corner, is it because you don’t like those holds and likewise when you climb something that’s graded really hard and you make easy work just accept that you are having a good day and really you are a good climber when all the dice are stacked in your favour. The grade is only someones opinion and likewise you can have your opinion. In any case the grade won’t be far out, hopefully. Above all what ever you are climbing enjoy it regardless of its grade. Climbing relies on good footwork and good footwork relies on good shoes. There is a lot of technology involved in climbing shoe manufacture to aid your climbing experience. 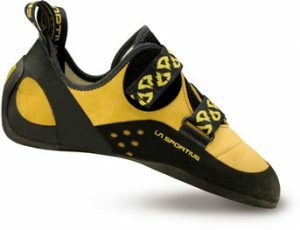 The top climbing shoe manufacturers use a variety of quality rubbers, no rubber is better than any other, but the rubbers used have different properties which operate better at different temperatures. The main thing is to keep the rubber soles of your shoes clean, this will keep them sticky. How long should climbing shoes last? Some rubbers are soft. This means they will wear quicker, but poor footwork will wear your shoes very quickly. I go through a pair a year using them about 3 times a week, but like anything, the more you use it the more wear it gets. With age, all rubbers will loose their properties, they become hard and inflexible and they won’t stick. It is not only the sole that wears. Over time the uppers loose their strength and the shoe does not support your foot as well so there is less power generated through your feet. Do climbing shoes have to hurt? Your shoes should not be painful to wear, they might be tight, they might pinch, but they should not HURT. There are more than 5 well known brands of climbing shoe distributed throughout the UK, for example Boreal, Scarpa, Evolv, Spotiva and Tenaya. These brands between them probably produce 50 styles of climbing shoe. The game is to find the shoe that fits your foot like a slipper. From all these shoes I have only found 2 styles, which are from 2 different manufacturers, that fit me. If the shoe hurts it is the wrong style for you. Shoe type is dictated by the style of climbing; rock type, steepness, time wearing the shoe, indoor or out, bouldering or routes, but no matter what style of climbing you are doing the main thing with your shoe is that it is comfortable and this is achieved by making sure it fits correctly. Heel – No baggy spots. Arch – Flat or raised arch, it shouldn’t squelch. If it is called a female specific shoe and it fits – just wear it. Don’t be gender specific about your feet, female specific shoes have a slightly different cut. There are no male specific shoes, the rest are unisex. Don’t get too bogged down with shoes. 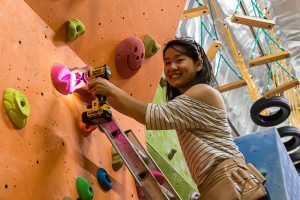 There are climbers wearing trainers that climb better than me, but a climbing shoe that is personal to you and not rented, will give you a better experience whilst climbing. Happy Feet, Happy Climbing. Why is Alter Rock the best set wall in the UK (probably)? 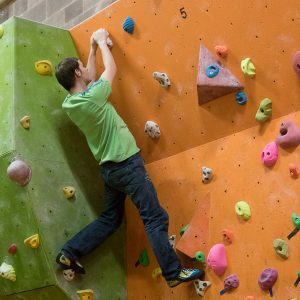 Garry discusses what makes a good setter and how we make sure that we always have an interesting variety of routes available for advanced climbers and beginners too. Some time ago on a Wednesday afternoon the setter was busy setting problems and we were in conversation, the topic being climbing, what else? He stated that “Alter rock was the best set wall in the UK”. I looked at him a bit puzzled as I know other climbing centres are well set and asked him why he thought that. 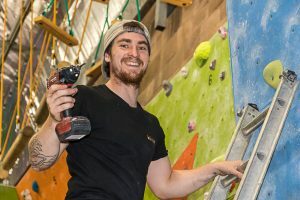 His reply was “ because Alter Rock employed the best UK climbers to do the setting.” He said this with a big grin on his face, because he included himself in his statement and rightly so. This particular setter no longer sets at Alter Rock. Like many others that have set for us, things change, life gets busy so things move on. Over the years Alter Rock has employed many setters that have come and gone. All have been top end climbers and all have been competent route setters, setting interesting routes and at the end of the day that is what our customers need. Because of our setting routine there is constant change on the walls and even when the lines or problems are set by the same setter on the same day they are so good at what they do that they give variety. What makes a good setter? 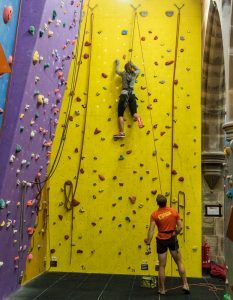 Its not easy being a setter, it helps to be a top end climber so you can set hard routes but at the same time you have to be able to set easy routes for children. They have to be able to set for the tall and the short and make every route or problem in their set different using all the different edges and angles. They are constrained by the holds available in design and colour and what is already on the walls so the colours don’t clash. How do we find our setters? In the early days Mark “Zippy” Pretty came to us. This was through word of mouth. The first setter we had was Jamie Cassidy, I think he introduced us to Rob Napier who introduced us to Mark. Jamie stopped setting for a while, but I understand he is back doing stuff and Rob became too busy to fit us into his diary as he is competition setting around the world. Mark then introduced us to Steve McClure. Well I think that’s how it happened. These two are still setting for Alter Rock. Recent setters to join our rota are Dom Garden, and where you have a Garden you need a Gardner and that comes as a James Gardener. Dom came to Alter Rock via Matt, who left for France, then came back, so we are seeing Matt Pearson again and the newest climber to our line up is Ian Moody who does not live up to his name. Whilst I was climbing today I dwelt on the fact that perhaps the cheeky setter was right that Alter Rock is the best set wall in the UK. Alter Rock has always used a variety of good setters for its routes and problems giving lots of variation. All setters are different, they have their favourite holds, their favourite moves and when combined they leave their own signature and generally by the way the climb feels you know who has set it. 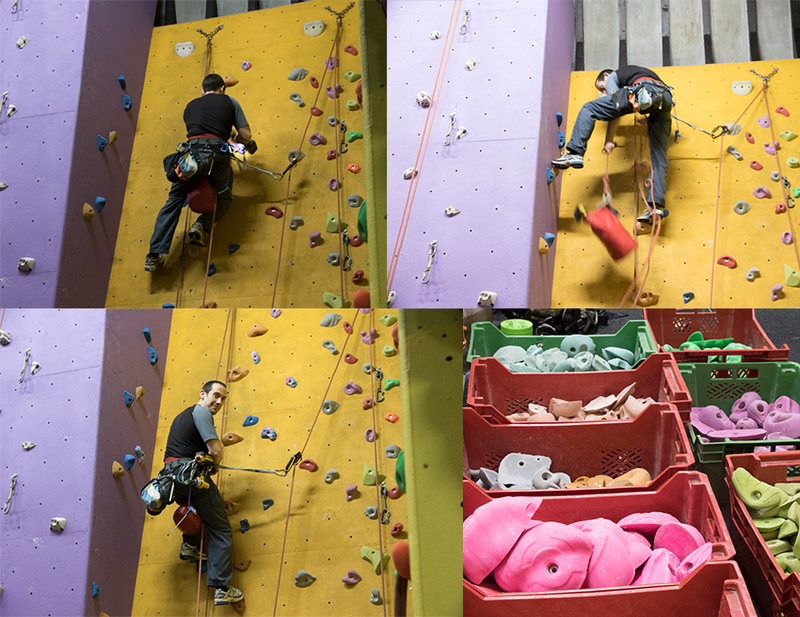 I reflected at the end of my session how pleasing it was to climb the routes and how well set they are. Having 6 of the UK’s best climbers setting at Alter Rock does give a lot of variety to its climbing. Do you know your jugs from your crimps, your clip from your crux or your dyno from your static move? 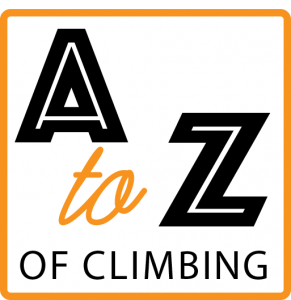 If you’re not sure read our glossary of commonly used climbing terms below, and you’ll soon be an expert in the jargon. Arete – an edge where two walls meet sticking out. Belay – device used to control the rope by the belayer. Belayer – the person who looks after the climber ensuring they never fall to the ground. Bridging – where your left foot and hand are on 1 wall of a corner and your right foot and hand are on the other wall of a corner. Climbing – ascending something with a rope. Clip – extender, the bit you clip the rope into on your way up. Corner – where there is a change in the wall direction making an internal corner. Crux – Latin word meaning cross, is the hard bit of a route. Guppy – a protruding hold that is squeezed between the palm and the fingers so that the hand forms a cup. High Ball Bouldering – like soloing but not so high, but higher than bouldering, usually above mats. Holds – the coloured blobs that we hold onto and put our feet on. Knot used to belay or abseil. Also known as a Münter hitch. Recommended when you have dropped your Sticht plate down the crag. Not recommended for multiple abseils as it twists the rope. Jug – very large hold. Karabiner – metal loop used for joining bits of climbing equipment, or crab for short. Layback – a technique used for crack climbing by leaning away. Lower off – the final clip at the top of the route which you put the rope into to be lowered off. Mantel shelf – coming from the piece above the fire place. Having hands on the shelf then straighten the arms to then bring a foot up and match with the hands and then stand up. No hands rest – when you are balanced on your feet and you can release your hands. Quickdraw – Two snap-gate karabiners linked by a short sling equals one quickdraw. Used to connect protection to the rope when leading a traditional route, or to clip bolts when sport climbing. Redpoint – Leading a sport route after inspecting it, and maybe after practising individual moves, or simply any sport lead where moves have been done before (in the event of a fall). Slab – climbing surfaces that leans away from you. Smear – with hands or feet where the climber pushes against a surface where there is no hold or the hold is very slopey. Static move – where you go to your next hold in control while maintaining 3 points of contact. Stepped overhang – like the underside of a staircase, it overhangs with the occasional step. Vertical – climbing surface that is vertical. Volume – an added section which is temporary and acts as an obstacle to be climbed around or over. Wired – to have a route “wired” means to have its moves completely figured out, usually through practice or by watching someone else on it. Yo-Yo – to climb a route in a style where, if you fall off, you return to the ground, leaving all your protection in place and then start climbing again after a rest. The yo-yo refers to the repeated up and down movement of the climber who falls off more than once on a hard move. A common style of ascent in the 1970s and early 1980s, before the preferred style became redpointing. Zone – to be “in the zone” is to be in THE perfect mental state for climbing. We couldn’t think of any climbing terms beginning with x. If you can, please email and we’ll include them in the list. Thanks to Chris Bate and Charles Arthur for some of the terms, see this article.